If you look like this, you’re wrong! You are at:Home»Uncategorized»If you look like this, you’re wrong! The Air Force decided to step up its graphics game to give airmen a more visual representation about new grooming guidelines. Shouts out to Airman 1st Class Joshua Green for this graphic illustration. Check it out. While I wonder why in the hell someone would try to come in/be in the military with a “grill” (which I find stupid anyway), I know that they wouldn’t be publishing this if someone didn’t try…. 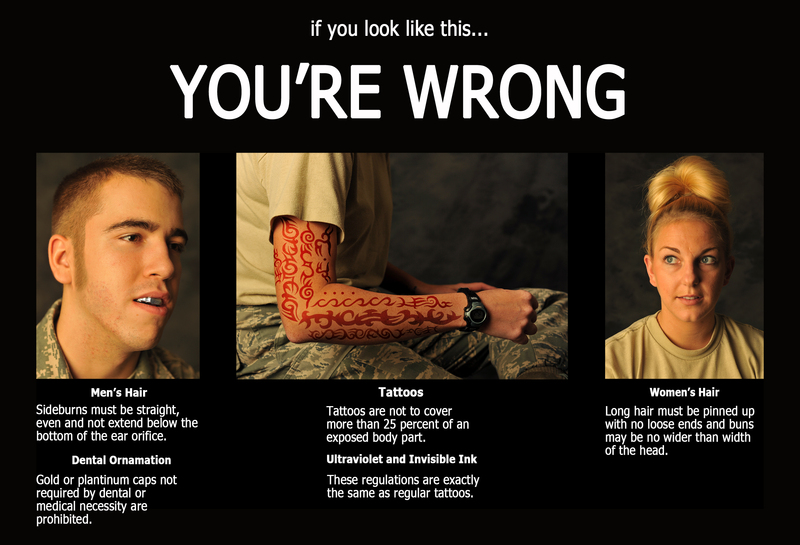 Why are all the airmen pictured here looking “wrong”white? How many Caucasians have grills? Why they got to use a white boy as an example for a grill. I can imagine the brainstorming that went into that decision lol. The rules sound reasonable to me, moving with the times, but barring anything too over the top.